Pre-purchase Counseling is for clients who wish to become homeowners. Certified credit counselors will work with families and individuals on a one-to-one basis and assist them in determining if they are ready for homeownership or if they need help with debt repayment or saving for down payment and closing costs. Online classes are also available here. Post-purchase Counseling is for clients who are struggling to make ends meet after purchasing a home or need help in financial planning for maintenance and repairs. Mortgage/Rental Delinquency Counseling is for clients who are behind with mortgage or rent payments. Certified credit counselors work with lenders and landlords to negotiate repayment arrangements or other available options. 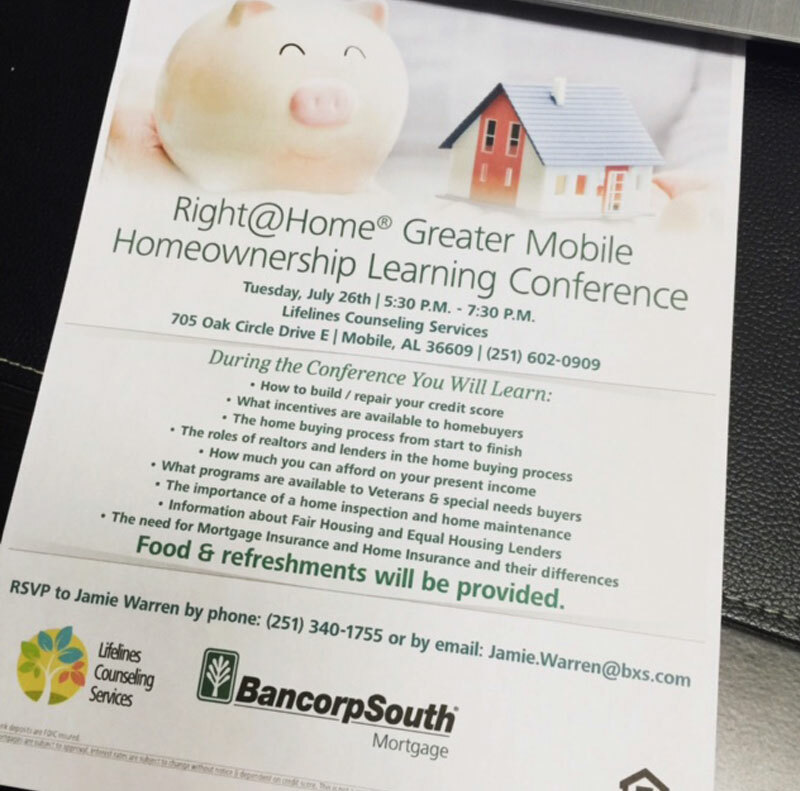 Home Buyer Seminars are for clients who are required to attend this special 6-hour education and obtain a Certificate of Completion. To learn more about this program, call 251-602-0011. Certain lenders or loan programs require this education for reduced interest rates, no down payment or closing cost loans, or to waive mortgage insurance premiums. Home Equity Conversion Mortgage Counseling (Reverse Mortgages) are loans for seniors aged 62 or older where they can access the equity in their homes. This counseling is required to obtain a reverse mortgage. The Mobile County Down Payment Assistance Program provides up to $10,000 in down payment and closing cost assistance. Participants must meet income and other requirements. CCCS of Mobile provides one-to-one pre-purchase home buyer counseling and 6-hour home buyer seminars for those eligible for this assistance. The one-to-one counseling is required prior to attending the seminar.